India has many tourist attractions which make it a big hit with visitors, who come here from all over the world. 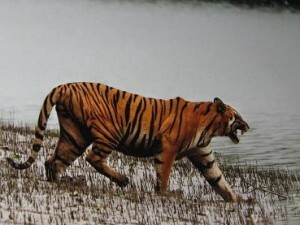 Apart from natural beauty, beaches, hill stations, India is a home to several wildlife sanctuaries and national parks. Periyar National Park, Bharatpur Bird Sanctuary, Ranthambore National Park, Sariska Tiger Reserve and Kumarakom National Park are famous names in the list. 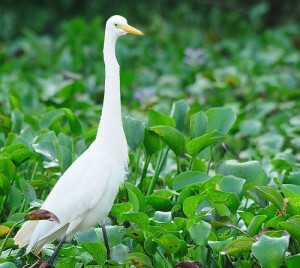 If you talk about wildlife tour in India, the land comes up with several wonderful options. One of them I visited which I would like to share with you. I was taken aback when my boss offered me to come along with him to Ranthambore. With a group of four colleagues, I looked forward to an exciting trip. Ranthambore National Park is one of the most famous national parks and wildlife sanctuaries in Northern India. Located in the Sawai Madhopur district of southeastern Rajasthan, it was the former hunting ground of the Maharajas of Jaipur. After a long tiring journey by Jodhpur Express, we reached Jaipur. Jaipur is around 132 km from Ranthambore. There we stayed over at a good hotel already booked for us. While enjoying our dinner at hotel we shared knowledge about this park and slept peacefully. The next morning, we started our jeep safari to the Ranthambore National Park. This five-hour ride took us through the entire park and we had the best glimpses of the flora and fauna. As we reached the park we saw a board which said that the park was open from October, November till end January and then from April to mid and then from May to end of June. So we can say that the best time to visit the park is from 1st October to 30th June. The early morning jeep ride was very chilly but as we covered ourselves with sweatshirt, gloves and muffler, we were enjoying being in dense forests. Graylag Goose, Padam Talao, Indian Hornbill, Great Crested Grebe, Snipes, Flamingos, Shrikes and Sparrows were some of the birds in our list we could see during our visit to park. As we moved ahead, I was expecting to see a tiger. But we got to see some Nilgai, Chinkara, Jungle Cats, the Mole Rat, Indian Fox and Porcupines. We all were excited to see the animals freely roaming around. We also saw Mongoose, the five striped palm Squirrels and the Vampires. It was a real fun to see some water bodies like frog and toad in the jeep safari. The next morning my boss decided to set out to spot tigers. Two of my colleagues relaxed in the hotel. I accompanied my boss and we left early morning. We reached the rock and found some tigress. 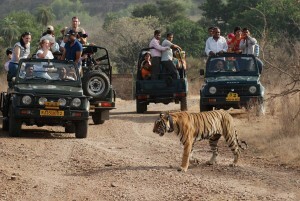 Some other tourists were also excited to see the tigress and their excitement created an atmosphere of commotion. The tour guide told us that we could not make noise so all the commotion settled and we waited to catch the best glimpses of tiger and finally we did it. I captured a few good shots there. While making our way back, we also saw some monkeys hanging from the branches. Finally, we moved towards our hotel. I was glad to visit the best wildlife tourist spot, Ranthambore National Park. 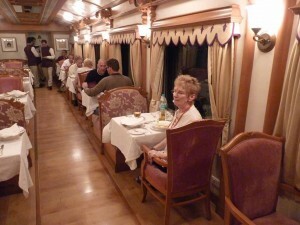 «Next Post Royal Rajasthan on Wheels – Rekindle the Charm of Luxury!